With the ever-changing conditions, now it's more important than ever to share your recent trip reports with other members of our community. How many times have you been on a trail recently, only to have to change your plans last minute because conditions were different than expected? With the ever-changing conditions, now it's more important than ever to share your recent trip reports with other members of our community. Hikers and climbers are out in droves this time of year to get reacquainted with our green spaces after a winter of dreary weather. We have an unusually deep snowpack this year, and many trails you should be able to hike are still under snow. Help us help each other by sharing your recent trip reports. Learn the elements of a good trip report, how to share your trip report, and read a few of our favorite trip reports from recent weeks. It's best to write up the details from a trip while the memories are still fresh! Include a description of both the trail and trail head. Take note of overflow parking patterns, trail detours, or anything else that might not be included in a previously published trail guide. If you are scrambling, climbing, or otherwise traveling off trail, include topographical details that might help with route finding. Share a photo or two of your trip, especially if they're useful in pointing out trail detours or obstructions. The Mountaineers has an official process for filing an injury report online, but a trip report is another opportunity to share with others how any incidents, such as injuries, route hazards, or inclement weather, affected your trip. Trip reports can be filled out in a couple of ways. If you've recently completed a trip with The Mountaineers, you'll receive a link via email to provide Feedback for that activity. 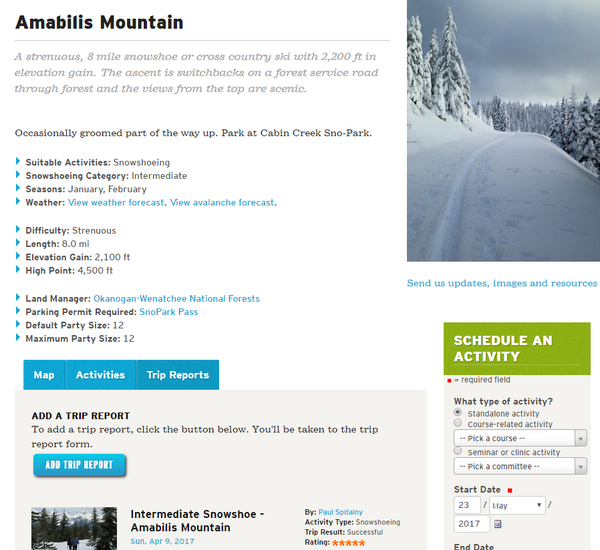 Or, add a trip report by exploring our Routes and Places. Simply scroll through and select a route or place. Choose the blue "Trip Reports" button on the route/place description, and you'll see any listed trip reports along with an option to add a trip report. Whether you recently completed a trip with us, on your own, or with a group outside of The Mountaineers, we'd love to hear more about your trips!. All new trip reports appear on our homepage and will be filed alongside other reports in our online database of Routes and Places. 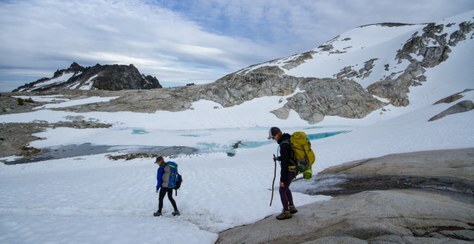 "Bailed on the couloir due to avi conditions, scrambled to the colchuck glacier col instead. Spiking temps increased avi conditions considerably." "We completed a loop trip on varied terrain. May is a good time of year for this peak. Miller Creek full enough to require Tevas for some, though with log crossings and waterproof boots some kept their feet dry. No remaining concern for avalanches or cornices on this route this year." "The Hamilton Mountain trailhead parking area was almost completely full (several dozen vehicles) at 9:30. We were lucky to get the last three spots - WA State Parks personnel closed the parking area right after we pulled in. Additional parking is available in the camping area, but that means a long walk down the road to the trailhead. Go very early if you do."" "Trail closed between Grand Prospect and East Peak due to logging...I looked but was unable to find any addition info about the closure on either WTA, DNR, or elsewhere, so no word on how long the closure will last."